CJ 4DPLEX, the world's leading 4D cinema company, has increased the European footprint of its 4DX technology by 65 percent in the past year. After first coming to Europe in 2012 with the opening of four 4DX theatres, CJ 4DPLEX has spent the last 12 months rolling out its immersive cinema technology - featuring moving seats and environmental effects such as wind, rain, scents, and much more - across the continent. The expansion has reached 20 new European locations that have opened from May 1, 2016 through April 30, 2017, including the first 4DX theatres in Slovakia, Serbia, Norway and France. As of April 30, 2017, there are 51 4DX theatres across 16 European countries. By comparison, at the end of April 2016, there were 31 4DX theatres across Europe. A major reason for this expansion is the passionate following 4DX has in Europe, where 59 titles were showcased in the format in 2016 alone. The newest title to be released in 4DX is Guardians of the Galaxy Vol. 2, which is currently being presented on all 51 European screens. 4DX screenings of The Fate of the Furious recently generated 20 to 30 percent higher occupancy rates in Europe than the worldwide 4DX average occupancy rate (56 percent) during the film’s international opening week. Some of the film’s strongest success in this format took place in France, where 4DX screenings The Fate of the Furious saw an average occupancy rate of nearly 100 percent, virtually selling out during the entire two weeks of the film's 4DX run. Other notable opening weekend occupancy rates for the global blockbuster include Croatia (98 percent), Norway (89 percent), Switzerland (86 percent) and Portugal (82 percent). 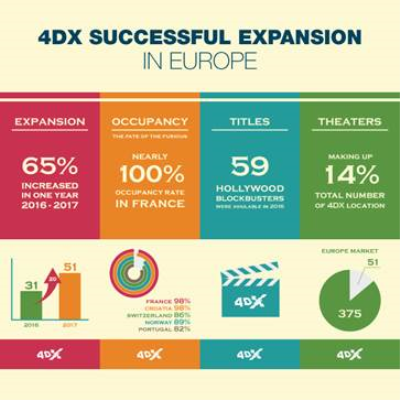 “Europe is one of our important markets, with theatres on the continent currently making up 14 percent of the total number of 4DX locations around the world. We eagerly continue to rapidly expand our reach in the region, building solid partnerships with new multiplex operators and maintaining reliable relationships with existing partners as we grow our European footprint,” said Byung-Hwan Choi, CEO of CJ 4DPLEX. In Europe, 4DX is currently available in Russia, Hungary, Poland, the Czech Republic, Bulgaria, Croatia, Ukraine, the United Kingdom, Switzerland, Romania, Turkey, Portugal, Slovakia, Serbia, Norway and France. The most recent 4DX theatre openings, in France and Norway, have seen an overall average occupancy rate of 80 percent for the duration of an entire month since they launched. A new 4DX location in Europe - the 52nd on the continent - is set to open in partnership with Hollywood Megaplex (HMP) in Austria in the next few months.